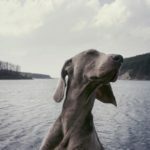 Home » Dog Breeds » Is a Chinese Crested Dog Right for You? Little dogs are all the rage this year, especially for apartment-dwellers or those who are not athletically inclined. A toy breed that once was nearly extinct, the popularity of Chinese Crested dogs has continued to grow. Is a Chinese Crested right for you? Chinese Crested dogs are affectionate, loving animals due to their history as a companion breed. They are loyal and alert, yet also spirited and playful. 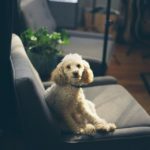 Due to their tendency to form strong bonds with their owners, Chinese Crested dogs can be prone to separation anxiety and may struggle with time alone. There are two types of Chinese Crested dogs: Powderpuff and Hairless. The Powderpuff variety has long, soft hair that can sometimes be high maintenance. The Hairless version can either be completely hairless from head to tail, or be “hairy hairless” with hair on face, tail, and legs. Hairless dogs require skincare such as regular baths, sunscreen, and moisturizer. Unlike other dogs, hairless varieties have sweat glands and are prone to developing acne. Regardless of variety, Chinese Crested dogs are small, typically weighing only 7 – 12 lbs. Chinese Crested dogs can play well with other pets, but may also be jealous when a favorite owner gives attention to another pet. Per the American Kennel Club, 85% of Chinese Crested owners agree this breed gets along with other animals. The Chinese Crested dog is skilled at Agility and is quick to learn. This breed is sensitive, however, and requires gentle training methods. These dogs are perfect for the owner who seeks the versatility and intelligence of the Border Collie, but the size of a Chihuahua! 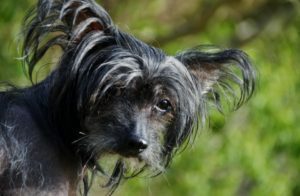 One common issue among the hairless variety of the Chinese Crested dog is poor dentition, with “primitive mouth” also being common, where each tooth is pointed. Teeth might be crowded, missing, or poorly aligned, making soft food a necessity. Although athletic, Chinese Crested dogs are not overly energetic. They are equally suited to lounging on the couch as they are romping around the yard. Due to its small size, even the most energetic of Chinese Cresteds will tire easily from a 20 – 30 minute brisk walk. The two varieties of Chinese Cresteds, the Hairless and Powderpuff, have different health traits. Powderpuffs are far less likely to have dental problems. Both, however, may display a primitive mouth. Eye disorders are common in both the Powderpuff and Hairless, including glaucoma, lens luxation, Progressive Retinal Atrophy, and dry eye syndrome. If purchasing a Chinese Crested dog from a breeder, be sure to inquire about genetic testing for eye disease. 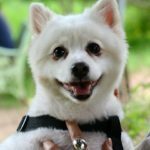 Chinese Cresteds also develop Canine Multiple System Degeneration and Progressive Neuronal Abiotrophy at a higher rate than other breeds. Symptoms for these neurological disorders are observed between 6 and 10 weeks of age. The typical lifespan of the Chinese Crested dog is 12 – 14 years, which is on the lower end for a toy breed.